My Brighton touchscreen exhibit at Brighton Museum. 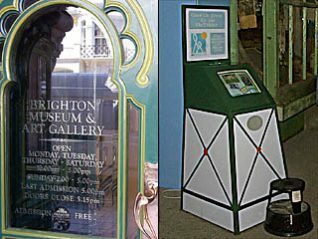 The ‘My Brighton and Hove’ website is based on a unique museum exhibit that opened in Brighton Museum in 1994. American Express, the largest private employer in Brighton, had donated £25,000 to Brighton Museum and Art Gallery. The money was to fund an “Interactive Community History Project”. The subject matter was to be the history of Brighton and its local community; the medium, an interactive touchscreen exhibit. A totally excellent site. Thank you. Whilst the present is always going to later be part of history, let’s hope that as many people as possible who are still alive to remember the 1930s and onward will contribute to this very good site so that its aim is fulfilled as efficiently as possible. Buildings tell a tale in one way but any comment from anyone of those times more truthfully exposes the facts of history for the future. There can surely never be enough content of any sort to show the past as it was.